"To the passerby, to the casual user, the word free has an obvious connotation — free as in zero cost. But this is absolutely wrong. It is not what is meant by the phrase “free software” and that is exactly why there’s a problem. " I’ve been an open source advocate, devotee, user, and developer for many years. I’m a member of the Free Software Foundation (FSF). I frequently write about the Open Web, Social Web, and Open Source of all types (software, hardware, science, data, Web standards). Much of my recent work has been licensed under the GPL. The GPL is administered and promulgated by the FSF. Apparently what is now considered the open source movement, actually was the result of a schism from the free software movement. In other words, open source was spawned out of the free software movement, not the other way around. To some, there are philosophical differences between the two movements. They can best be summed up as follows: all free software is open source but not all open source software is free (although much of it is). You can learn more about the subtleties of this argument in this article on the GNU website, Why Open Source misses the point of Free Software. This brings me to the point of this post. The usage of the word free has caused and continues to cause confusion — so much so that the article linked-to above spends time defining what is meant be the word. There are additional places on GNU’s website that take time to explain what is meant by the word free. In fact, there is even an entire article devoted to defining the phrase “free software” and the word “free” (see, What is free software?). When you have to spend paragraphs, yet alone entire articles, defining and explaining two simple words in a two-word phrase, something is wrong. The various paragraphs and articles on this topic on GNU’s website use catchy phrases to better define the “free software” phrase. To the passerby, to the casual user, the word free has an obvious connotation — free as in zero cost. But this is absolutely wrong. It is not what is meant by the phrase “free software” and that is exactly why there’s a problem. The GNU website once again has another article to help dispel the assumption that free software is free as in zero cost (see, Selling Free Software). This issue has caused numerous headaches for me and other developers of FOSS (Free and Open Source Software ) projects. For instance, there are many WordPress, BuddyPress, and Drupal users who wrongfully assume that plugins are mandated by the GPL to be free as in cost. When this incorrect assumption is corrected — by pointing them to the Selling Free Software article on GNU’s website — they then take the stance that open source software should not cost anything. After all, they can download WordPress or Drupal for zero cost. So why shouldn’t all plugins or modules be free as in cost? Of course, these same people often have no qualms with purchasing a premium theme from a design shop. They fail to see the irony in expecting developers to code and support their work for free, but smiling at designers who create high-quality themes and charge for them. To be fair, there have been developers who have sold their work for years. In fact, there are more starting to do so each day. However, the concept of free as in zero cost is a direct result of using the phrase “free software”. It has caused and continues to cause issue for those of us who wish to make a living creating high-quality software with freedoms. I wrote about the “free software” conundrum from a developer’s perspective in an article two-years ago (see, How Can BuddyPress Developers Earn a Living?). Reading the comments sheds more light on this issue. In essence, free software is software with freedoms. Saying that would be straight forward and lead to a lot less confusion. Time could then be spent on defining and discussing those freedoms without any need to bother defining the ambiguity of a word like free. It seems to me that the phrase “free software” is more of a marketing slogan or buzzword. Whereas “free software” does roll off of the tongue, and it does sound more tasty, the fact that it requires so much time and effort to effectively define is a problem. I propose all FOSS / FLOSS advocates start using the phrase “software with freedoms” instead of “free software”. That way time can be spent on discussing those freedoms and not correcting the mistaken assumptions of cost. As an additional benefit, I imagine that the phrase “software with freedoms” would translate very well into a majority of languages keeping its contextual semantics intact — that is for languages that have a word for software. The Free Beer logo is an inside joke based on the issues discussed above but has transformed into a movement of its own . You can learn more about it here, The Geekiest Beer on Earth, and here, Free Beer! 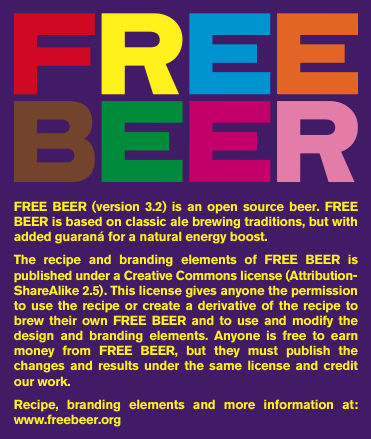 You can also get your own zero-cost copy of the Free Beer logo to use on your own craft brews by visiting the Free Beer project. There truly is mass confusion about free software and open source, unfortunately. At the end of the day, there just is no free lunch – anywhere. We all have to work harder n educating ourselves and others and nowhere more so than in your field, it seems. Thanks for the comment, Jessica. In all fields of endeavor, educating the userbase is crucial to success. Unfortunately, as Kingsley rightfully pointed out my G+ post on this topic, the schism between the Free Software and Open Source people has not been healthy to the movement. Of course, few schisms are healthy! Also, others continue to leverage Open Source innovations for pure profit, without giving anything back to the community. This results in a negative feedback, making some people feel as if charging a fee for software is bad. As I state above, developers of Open Source software need to earn a living too. The difference is that we turn over our IP so that others have the freedom to use, adapt, and improve upon it. Those freedoms are granted for zero cost. The FSF may not like it, but I simply use the term “Open Source” even for GPL licensed software. I agree. I use the term Open Source to mean the broader category that includes the software with freedoms folk as well. The FSF does have a point about the differences since not all Open Source projects offer the freedoms that users have become accustomed to via FOSS licensing like GPL, BSD, or MIT. Jeff, thanks for shedding light over this matter. I, too, believed that free software is a no cost software. It is much better to use the term software with feedom. Much, much better. Reading the translation into Romanian (as I am form Romania) I could see a lot of confusion in the page with “selling free software” and I sent over an email to the translation coordinator. Wit your permisiions I will cope here the emails contents. As you will see, in other languages it is much easier to create a limit between free as is freedom and free as in no cost. The Romanian translation regarding “free software” is a bit off. Since free can be translated into Romanian as: gratuit (as in “free beer”), it also can be translated into “liber”, like in (“free speech”). We do have different words for that, you know? Like the Spanish say “libre”, we as Latin people have the same word “liber”. In the page from above the translation of “selling free software” is “vanzarea de software gratuit”, with the meaning of selling software that has zero cost. Also, in that same page “free speech” is translated to “discurs gratuit”, with the meaning of “cheap or no cost speech”. For that we have a more appropriate translation: “libertate de exprimare”, with the meaning of having the liberty to express yourself freely. It is a logical dissonance to say that and we could better use: “vanzarea de software liber”, meaning selling software that has freedoms associated to it. Jeff, thanks again for this insightfull post and the best of luck with promoting the Graphene Prairie. Manuel, thank you for the great comment!